Kilian, Robert, and Lambl first described spondylolysis accompanied by spondylolisthesis in the literature in the mid 1800s. The number of different spinal abnormalities contributing to development of spondylolisthesis was appreciated only after Naugebauer's anatomic studies in the late 1800s. See the image below. 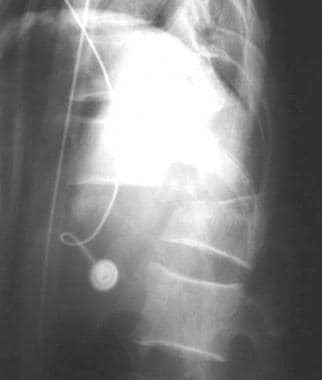 Radiograph of the lumbosacral junction showing a grade 1 spondylolytic spondylolisthesis at L5-S1. Spondylolysis is a defect in the pars interarticularis that may or may not be accompanied by forward translation of one vertebra relative to another (spondylolisthesis). See the image below. Axial computed tomography (CT) scan shows bilateral spondylolysis. Note elongation of the spinal canal at this level. Type I: Congenital spondylolisthesis is characterized by presence of dysplastic sacral facet joints allowing forward translation of one vertebra relative to another. 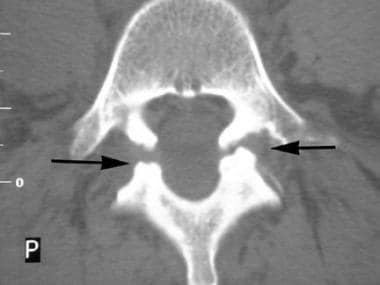 Orientation of facets in an axial or sagittal plane may allow for forward translation, producing undue stress on the pars, resulting in a fracture. 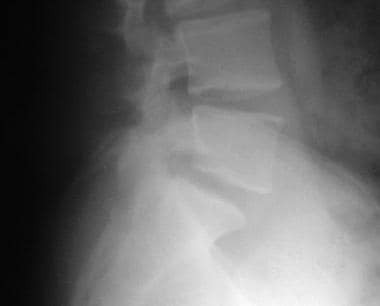 Type II: Isthmic spondylolisthesis is caused by the development of a stress fracture of the pars interarticularis. Type IV: Traumatic spondylolisthesis can, in rare instances, result from acute stresses (trauma) to the facet or pars. Type V: Any bone disorder may destabilize the facet mechanism producing pathologic spondylolisthesis. Iatrogenic spondylolisthesis, lastly, may occur if an overzealous surgeon performs too great of a facetectomy. Wiltse and Beutler each reported an incidence of 6-7% for isthmic spondylolysis. [2, 5] Up to 5% of children aged 5-7 years have been found to have spondylolysis, many of whom are asymptomatic. The incidence increases up to the 7% by age 18. Athletic activities requiring repetitive hyperextension and rotation or repetitive combined flexion-extension predispose some athletes to developing pars defects. [6, 7, 8, 9] Gymnasts, linemen in college football, weight lifters, javelin throwers, pole-vaulters, and judoists are most commonly affected. [10, 11] Approximately 82% of cases of isthmic spondylolisthesis occur at L5-S1. Another 11.3% occur at L4-L5. Congenital defects, including spina bifida occulta, have been linked to occurrence of isthmic spondylolisthesis. Scoliosis has been found to occur along with spondylolysis as well. Roughly 50% of all cases of spondylolysis are not associated with spondylolisthesis. Degenerative spondylolisthesis occurs more frequently with increasing age. The L4-L5 interspace is affected 6-10 more times than any other level. Sacralization of L5 is frequently seen with L4-5 degenerative spondylolisthesis. Increased mortality is not associated with spondylolisthesis. While some patients may have persistent low back pain, significant disability is rare unless the patient has severe neurologic compromise that has not been addressed. The most common morbidity is persistent low back pain or nerve impingement. Because disk degeneration is accelerated at the sight of level of the spondylolysis, diskogenic pain may occur. Degenerative spondylolisthesis produces characteristic arthritic symptoms that may worsen with age. Isthmic spondylolytic defects affect roughly 1.1% of black females. The most commonly affected group is the white male with an incidence of 6.4%. Arkara Plains Indians and Aleut people groups have a very high incidence of spondylolytic defects, due to a combination of genetic and environmental factors. Degenerative spondylolisthesis affects black females more commonly than white females (and females are more commonly affected than men). Females with isthmic spondylolytic lesions appear to be more prone to progressive displacement and may need surgical intervention more often than males. Congenital spondylolisthesis (dysplastic type) occurs with a 2:1 female-to-male ratio with symptoms beginning around the adolescent growth spurt. These comprise about 14-21% of all cases of spondylolisthesis. Degenerative spondylolisthesis occurs more commonly in females with a 5:1 female-to-male ratio. The incidence increases after age 40 years. Acute isthmic spondylolysis often occurs during the first and second decades of life. Most cases occur before the patient reaches age 15 years. In rare cases, acute spondylolysis may be seen in early adulthood. Younger patients are at higher risk than older patients for developing progressive spondylolisthesis. The risk for progression in adults is rare when the lesion is at L5. In contrast, lesions at L4-5 may progress into adulthood because of increased sagittal rotation, shear translation, and axial rotation at this segment. Congenital/dysplastic spondylolisthesis has been documented in children as young as 3.5 months. More commonly, congenital spondylolistheses go undiagnosed until later in life after an individual has been ambulating for quite some time. Degenerative spondylolisthesis occurs most commonly after age 40 years. Niggemann P, Kuchta J, Beyer HK, Grosskurth D, Schulze T, Delank KS. Spondylolysis and spondylolisthesis: prevalence of different forms of instability and clinical implications. Spine (Phila Pa 1976). 2011 Oct 15. 36(22):E1463-8. [Medline]. Wiltse LL. Spondylolisthesis: classification and etiology. Symposium of the Spine. Am Acad Orthop Surg. 1969. 143. Grobler LJ, Wiltse LL. Classification, and nonoperative and operative treatment of spondylolisthesis. Frymoyer's The Adult Spine: Principles and Practice. 2nd ed. Philadelphia, Pa: Lippincott; 1997. 1865-921. Huang KY, Lin RM, Lee YL, et al. Factors affecting disability and physical function in degenerative lumbar spondylolisthesis of L4-5: evaluation with axially loaded MRI. Eur Spine J. 2009 Jun 14. [Medline]. d'Hemecourt PA, Gerbino PG, Micheli LJ. Back injuries in the young athlete. Clin Sports Med. 2000 Oct. 19(4):663-79. [Medline]. Comstock CP, Carragee EJ, O'Sullivan GS. Spondylolisthesis in the young athlete. The Physician and Sportsmedicine. 1994. 22(12):39-46. Rossi F. Spondylolysis, spondylolisthesis and sports. J Sports Med Phys Fitness. 1978 Dec. 18(4):317-40. [Medline]. Sairyo K, Katoh S, Sasa T, et al. Athletes with unilateral spondylolysis are at risk of stress fracture at the contralateral pedicle and pars interarticularis: a clinical and biomechanical study. Am J Sports Med. 2005 Apr. 33(4):583-90. [Medline]. Bono CM. Low-back pain in athletes. J Bone Joint Surg Am. 2004 Feb. 86-A(2):382-96. [Medline]. Oh JY, Liang S, Louange D, Rahmat R, Hee HT, Kumar VP. Paradoxical motion in L5-S1 adult spondylolytic spondylolisthesis. Eur Spine J. 2011 Jun 15. [Medline]. Peterson JB, Wenger DR. Asymmetric spondylolisthesis as the cause of childhood lumbar scoliosis--can new imaging modalities help clarify the relationship?. Iowa Orthop J. 2008. 28:65-72. [Medline]. [Full Text]. Wynne-Davies R, Scott JH. Inheritance and spondylolisthesis: a radiographic family survey. J Bone Joint Surg [Br]. 1979 Aug. 61-B(3):301-5. [Medline]. [Full Text]. Sakai T, Goda Y, Tezuka F, et al. Clinical features of patients with pars defects identified in adulthood. Eur J Orthop Surg Traumatol. 2015 Dec 13. [Medline]. Forsth P, Svedmark P, Noz ME, Maguire GQ Jr, Zeleznik MP, Sanden B. Motion Analysis in Lumbar Spinal Stenosis With Degenerative Spondylolisthesis: A Feasibility Study of the 3DCT Technique Comparing Laminectomy Versus Bilateral Laminotomy. Clin Spine Surg. 2018 Jun 22. [Medline]. Longo UG, Loppini M, Romeo G, et al. Evidence-based surgical management of spondylolisthesis: reduction or arthrodesis in situ. J Bone Joint Surg Am. 2014 Jan 1. 96(1):53-8. [Medline]. Matsudaira K, Seichi A, Kunogi J, et al. The efficacy of prostaglandin E1 derivative in patients with lumbar spinal stenosis. Spine. 2009 Jan 15. 34(2):115-20. [Medline]. Overley SC, McAnany SJ, Andelman S, et al. Return to Play in Adolescent Athletes With Symptomatic Spondylolysis Without Listhesis: A Meta-Analysis. Global Spine J. 2018 Apr. 8 (2):190-7. [Medline]. [Full Text]. Yamazaki K, Kota S, Oikawa D, Suzuki Y. High defect stage, contralateral defects, and poor flexibility are negative predictive factors of bone union in pediatric and adolescent athletes with spondylolysis. J Med Invest. 2018. 65 (1.2):126-30. [Medline]. [Full Text]. Joaquim AF, Milano JB, Ghizoni E, Patel AA. Is There a Role for Decompression Alone for Treating Symptomatic Degenerative Lumbar Spondylolisthesis? : A Systematic Review. J Spinal Disord Tech. 2015 Dec 24. [Medline]. Inose H, Kato T, Yuasa M, et al. Comparison of Decompression, Decompression Plus Fusion, and Decompression Plus Stabilization for Degenerative Spondylolisthesis: A Prospective, Randomized Study. Clin Spine Surg. 2018 Jun 5. [Medline]. Lumbar oblique radiograph showing the "Scottie Dog." A pars defect is seen at L5. Diagram in the oblique projection shows the components of the vertebrae that result in the appearance of a Scottie dog with a collar.